The following essay originally appeared in Silence, Screen and Spectacle: Rethinking Social Memory in the Age of Information. This book is now available in paperback. In 2001, I began teaching a first-year seminar titled “Defining Blackness.” My journey with that class and its descendants is intertwined with my relationship with the memorial landscape, concrete and virtual, of the campus of the University of North Carolina at Chapel Hill. In its initial year, the class decided to take as its focus the idea of how blackness, specifically American blackness, might mediate and alter how people experience the physical campus. In class discussions we surmised that there is a segregation of knowledge and of perception that might become manifest by examining the memorial landscape and that there are aspects of the campus that might be invisible to some but highly charged to others. Our classroom overlooked McCorkle Place, the oldest part of the campus and a memorial nexus. McCorkle Place includes the first building constructed at a state university, Old East, which opened in 1795 and was constructed, in part, by slave labor. Directly outside our window was a Confederate soldier monument (universally referred to as Silent Sam) that dates to 1913, a gift of the United Daughters of the Confederacy. Recently Silent Sam has become the focus of a group of students (the Real Silent Sam movement) who have staged rallies and teach-ins in front of the statue to highlight current and historic acts of racial discrimination and white supremacy on the campus and in the community. Silent Sam faces Franklin Street (the main street of downtown Chapel Hill) and greets (or confronts) those who enter the campus from the north. 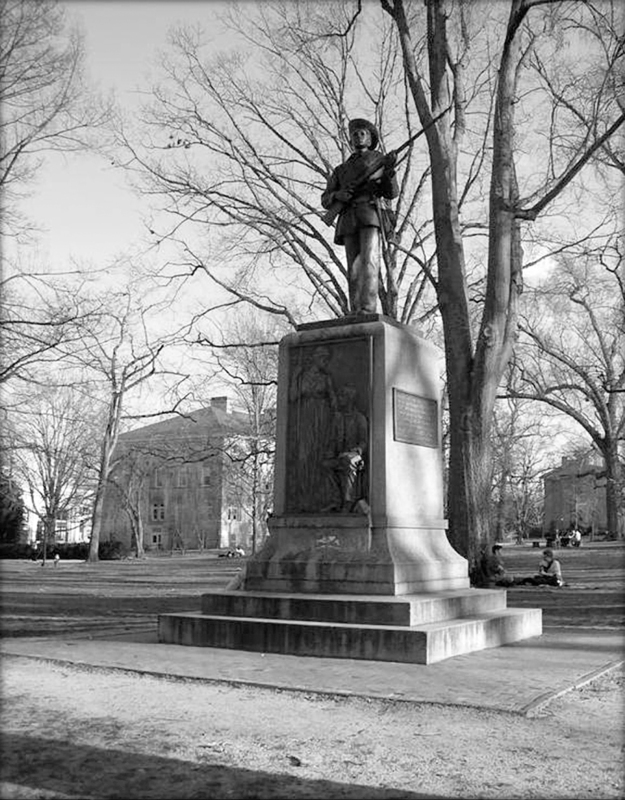 Silent Sam is perhaps the most well-known and often discussed memorial on campus and has been the site of a number of campus celebrations and protests. His multiple identities informed our class discussions of how the campus can be read and indicate the disruption within the “Carolina” identity: to be a Tarheel Blue do you also have to celebrate the Confederacy? Clearly the issue of multiple paradoxical identities has been and continues to be even more manifest at institutions such as the University of Mississippi and the University of Texas.1 Would a visiting high school student and her parents have a different response to Silent Sam based on their race(s)? Based on geography—would someone from Mississippi read him differently than someone from Vermont? A civil war soldier pointing his gun to the North is a common sight in North Carolina and throughout much of the southern United States, due in good measure to the many gifts of Confederate soldier memorials donated by the United Daughters of the Confederacy in the early twentieth century, clearly as part of the establishment of the myth of the Lost Cause. When the first “Defining Blackness” class explored the campus in 2001 there were no monuments or memorials that specifically emphasized black contributions to the history of the campus, but there were many that memorialized slave owners, white supremacists, and the Confederacy. A walking tour emerged out of the first “Defining Blackness” class to engage students with their physical surroundings through a process of explicitly racialized (specifically black) historical analysis. The tour attempts to alter the perceived landscape from its “normative” reading by consciously reinserting omitted and half-told stories. I call this tour Black and Blue to problematize the conflicts that can arise from being both a black person but also “Carolina blue” and to emphasize that black people, in a variety of roles, have been a part of the university since its inception. The tour has become a recruiting tool (particularly targeted at underrepresented students and their parents), a community-building event (through groups such as the Black Student Movement, the campus NAACP, and the Black Alumni Reunion), and an educational event (through the libraries, academic departments, and the visitors bureau.) The University has also created a virtual museum which includes a section titled “Slavery and the Making of the University” (UNC, Virtual Museum of University History, 2006). Recently, North Carolina State University has borrowed the model of this tour and modified it to its own history. 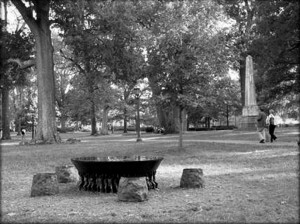 In 2005, the Unsung Founders Memorial was installed in Silent Sam’s shadow, creating a marked change in the memorial landscape since the first “Defining Blackness” class. An analysis of the symbolic landscape both monumental and archival reveals a nexus of racial remembering that affects and problematizes again the meaning of slavery and race to the University of North Carolina and to the United States as a whole. This study examines one very specific case of institutional memory and historical erasure written in stone (specifically, marble): the Unsung Founders Memorial. The University of North Carolina has a well-documented history of slavery that dates to its construction in 1793. Enslaved people were a vital part of the early University both as property of the students, faculty, and trustees, and also as the physical labor that built and maintained the campus. As the village of Chapel Hill developed around the university campus, many enslaved people and a few free black people were vital to the survival of the community. The central notion of the Unsung Founders Memorial, that enslaved Chapel Hillians are unsung, is contradicted by the extensive archives and Southern Historical Collection at the university. Writings of early inhabitants (such as Cornelia Phillips Spencer and William Battle),3 the legal and financial records of the university (the papers of university president David Swain, for example), and the poetry and other writings of George Moses Horton, an enslaved man who spent much of his time hiring himself out on the campus, are all primary sources and readily available.4 It was not until 2005 that a concrete symbol of the existence of the enslaved and free black residents of Chapel Hill was erected at the symbolic front door of the campus. The Unsung Founders Memorial provides a case study of memory, memorialization, and the uses of history in an environment filled with academic analysts and interested observers. The Unsung Founders Memorial fits into rapidly expanding discussions and debates about universities and slavery and the place that the past holds in the contemporary world. Many academic institutions have examined ways to publicly acknowledge their relationships with slavery, slave trading, and the slaveocracy. Generally this acknowledgment has taken the forms of a conference, a physical memorial, and a well-publicized web presence that includes documents and self-analysis exploring the institutional ties to slavery. An ongoing example of this phenomenon is occurring at Lewis & Clark College in Portland, Oregon. The college has attempted to remember York, the man enslaved to William Clark, to problematize the history of its namesake and of American history as a whole. Efforts to memorialize York were hampered by the literal erasure of York’s appearance from the documentary record. In 2010 a statue to York was erected on the campus. The campus website explains that “neither the physique nor facial features of the sculpture claim to represent what York actually looked like” (Lewis & Clark College). Ironically, the fact that there are no images or descriptions of Lewis and Clark’s Native American guide does not prevent a statue of Sacajawea from being prominent on the campus. Since 2004 a seven-foot tall statue of Sacajawea portrayed as a specific Native American individual resides near the symbolic center of the campus.5 How to give face to the de-faced, to give memory to the ignored and erased, is a significant aspect of the nascent slavery and universities movement. At UNC this is not exactly the issue, as many enslaved community members are well documented6 but have been ablated from modern public memory nonetheless (at least from the memories of the elite). Conferences at Emory, Brown, and Yale, among others, illustrate the growing interest by scholars in the topic and the desire among university administrators to discuss these issues. UNC, like many other universities, markets itself (both intellectually and pragmatically) on its history. On Franklin Street, as one approaches campus, there is a sign that reads “University of North Carolina at Chapel Hill / First state university to open its doors 1795. Chartered in 1789 under the constitution of 1776.” On job postings, at business meetings, and in the preamble to the university’s honor code, the age and historical significance of the university are emphasized. Since the 1980s there have been periodic, almost cyclical movements among students and other community activists demanding that buildings be renamed and that “corrective” histories be taught and disseminated widely about some of the founding figures in the university. For example, in the 1990s, a group at UNC came together under the name Campaign for Historical Accuracy and Truth (CHAT). Specific targets of these campaigns have included Saunders Hall (William Saunders was a Ku Klux Klan official and recruiter), the Student Book Store (named after Josephus Daniels who was instrumental in reinstating white supremacy in North Carolina in 1898, most notably in Wilmington), and most frequently, Silent Sam. In 1993, UNC’s bicentennial year, the chancellor created an annual award to recognize women who have made an outstanding contribution to the university; this award was named the Spencer-Bell award to honor Cornelia Phillips Spencer. Spencer is deeply enmeshed in the antebellum and reconstruction history of the university, most notably for ringing the bell that announced that the university had reopened after a five-year closure (thus the “Bell” in the Spencer-Bell award). The university had suspended operations during reconstruction for a number of political and financial reasons. Exactly what those reasons were is remembered differently by different modern constituencies of the campus and community. The remembering of the bell ringing and the forgetting of some of Spencer’s published statements about race and reconstruction led to several years of rancorous debate. By 2002, this debate about the choice of Spencer as a namesake for a university award had erupted into a public and heated controversy due to questions about her role in white supremacy, her racial views, and the assertion that she helped to keep the university closed until it was clear that black people would not be admitted. The position that Spencer was active in black disenfranchisement and exclusion was challenged by members of UNC’s history faculty as well as alumni and donors and resulted in acrimony and accusations of political correctness on the one hand and historical erasure on the other. In 2004, UNC hosted a conference titled “Remembering Reconstruction” which was a response to a series of campus discussions about the place that the names of slave owners and white supremacists held in the physical and symbolic landscape of the campus. The center of the firestorm was Cornelia Phillips Spencer. Her name and those of other members of her family are scattered about the landscape. The first woman’s dormitory on campus is named Spencer Hall (as is a dormitory at UNC Greensboro, the former Women’s College of North Carolina), and the physics and math building is named Phillips Hall (after her father and one of her brothers). In December 2004 UNC Chancellor James Moeser “retired” the award, due in good measure to the publicity of the conference and the activists. The choice of “retiring” rather than abolishing it was significant in situating Spencer within the university community. Cornelia Phillips Spencer’s great-grandchildren Spencie Love and Charles Love asked the chancellor to also remove the family name from Spencer Dormitory and to redirect family foundation money that had been earmarked to support Southern Studies at the University. Moeser was able to assuage their feelings and save the name of the dormitory and the money too. In a letter to Spencer’s descendants he wrote, “I regret the pain that this controversy has caused you and your family. The last thing we wanted to do in ending the Bell Award was to condemn Cornelia Phillips Spencer or to erase her from our past. The decision was one of practicality because a number of outstanding women on campus said they would not accept the award.”7 “More political correctness run amok at Carolina”8—a comment from a letter sent to Moeser—encapsulates the ideas expressed in a number of letters to the chancellor from alumni, donors, and other interested members of the community. The rift with Spencer’s descendants was healed (with great sensitivity as documented in a number of letters in Chancellor Moeser’s papers) and on April 21, 2007, UNC’s Center for the Study of the American South moved into the historic James Lee Love house which was once the home of Love’s mother-in-law, described in the press release as “activist and house resident Cornelia Phillips Spencer.” The use of the word activist here can be read in many ways, but it is definitely not hidden, invisible, or “unsung.” It seems to be a not so subtle transgression of the usual use of the word by those opposed to celebrating Spencer and “her times.” Today Spencer’s portrait greets visitors to the Center for the American South, and, of course, she faces north. The Remembering Reconstruction conference and its aftermath invoked a great deal of symbolic and practical tension on campus and among students, faculty, alumni, and community members. Some thought, as mentioned above, that this was “political correctness” and “historical revisionism”—terms often used in response to the chancellor’s choices about the conference and the Bell award. Others—mostly faculty and students—felt the outcomes of the conference to be too little, too late. The latter group suggested a Cornelia Phillips Spencer Day, to annually revisit the university’s history and its relationship to issues such as slavery, segregation, and civil rights; however, this proposal as well as a survey of the memorial landscape were rejected by the chancellor. Some activists felt the conference was a necessary but incomplete first step and that much more was left to do, including the renaming of buildings such as Saunders Hall, (re)moving Silent Sam, and increasing “corrective” signage on the campus. It was on the heels of the “Remembering Reconstruction” conference and the “retiring” of the Spencer-Bell award that the Unsung Founders Memorial was installed. Chancellor Moeser termed the installation a meaningful and substantive response the campus had made to address the issues raised at the conference: the lack of visibility of UNC’s historical links to slavery and white supremacy. The planning of the Unsung Founders Memorial began in 2001, when a monument to the slaves who built the university was selected as the gift of the graduating class of 2002. This selection was not without its own controversy, as it came shortly after the attacks of September 11, 2001. There were many students who wished to memorialize the events that had recently shaken them and had directly affected the campus community including the deaths of six Carolina alumni in the attacks. The slate of potential class gifts had been selected before September 11 and it was procedurally impractical to add another option to the ballot. In addition, a monument to enslaved workers, a scholarship for students who were struck by “sudden and unforeseen financial difficulty,” and a “marquee for Memorial Hall” (a performance space on campus) were the other proposed class gifts. The historical monument won with 44.9 percent of the vote. University administrators were interested in the symbolic value of this monument to the campus community, and offered to match the funds raised by the class of 2002 to allow the monument to be built in a timely fashion. The senior classes provided close to $50,000 and the provost’s office added an additional $40,000. When the Unsung Founders monument was dedicated, it did not enter into a memorial vacuum. As at most universities there were already a number of monuments and memorials dating back to the earliest days of the campus.9 In 1898, the class of 1891 erected a monument to four university “servants” on the grave of Wilson Swain Caldwell in the black section of the Chapel Hill cemetery. The year 1913 saw the dedication of Silent Sam (the Civil War monument) by the United Daughters of the Confederacy at the northern border of the University. 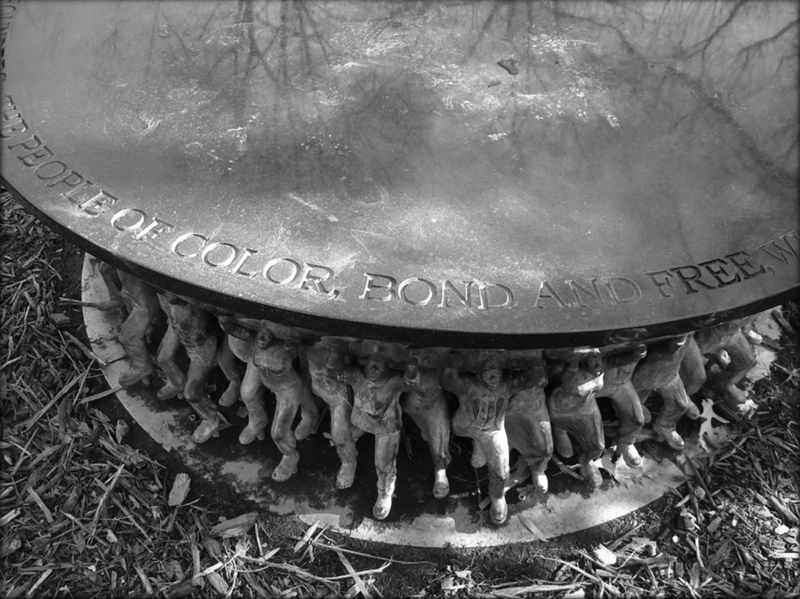 In 1990, students formed an organization called CAOS (Community Against Offensive Statues) to protest a public art installation titled The Student Body that was installed as a gift of the class of 1985 and which included highly stereotypical images of black and female (and black female) people (and possibly Asian10 stereotypes as well). In 1991, students at UNC occupied the president’s office to demand a freestanding black cultural center to be named after Sonja Stone, a professor in the African and Afro-American Studies Department who had recently died. As recently as 2011, the Real Silent Sam Movement11 has petitioned the Chancellor to discuss the ways that campus history is presented to the public and taught on campus. The memorial to the Unsung Founders was installed at the symbolic entrance of the Campus—the site of the original University and close to the old village of Chapel Hill; the monument is somewhat visible from Franklin Street—the old and still most critical thoroughfare. Its location within close proximity to Silent Sam was intentionally chosen to create a dialectic between representations of the Confederacy and of slavery. The Unsung Founders Memorial fits into the victims memorials trope discussed by Kirk Savage (2009) in his discussion of the National Mall in Washington, D.C. The monuments to those who suffered death, defeat, and degradation contrast (both symbolically and structurally) with the heroic monuments that surround them, both on the National Mall and on the UNC campus. The Unsung Founders Memorial also does not pass Savage’s “Iwo Jima” test (2009: 276–77) in that it is physically low and relatively small as well as non-representational and not “heroically active,” which disrupts its ability to create a powerful and significant memory in the memorial landscape. Savage’s “Iwo Jima test” discussion (2009: 261–84) is specifically focused on Maya Lin’s Vietnam Veterans Memorial and the criticisms it engendered; the parallels with the Unsung Founders Memorial are multiple, including the setting, the scale, and the ethnic identity of the creator, all of which are discussed below. The monument was unveiled on May 11, 2005 and officially dedicated on November 5. 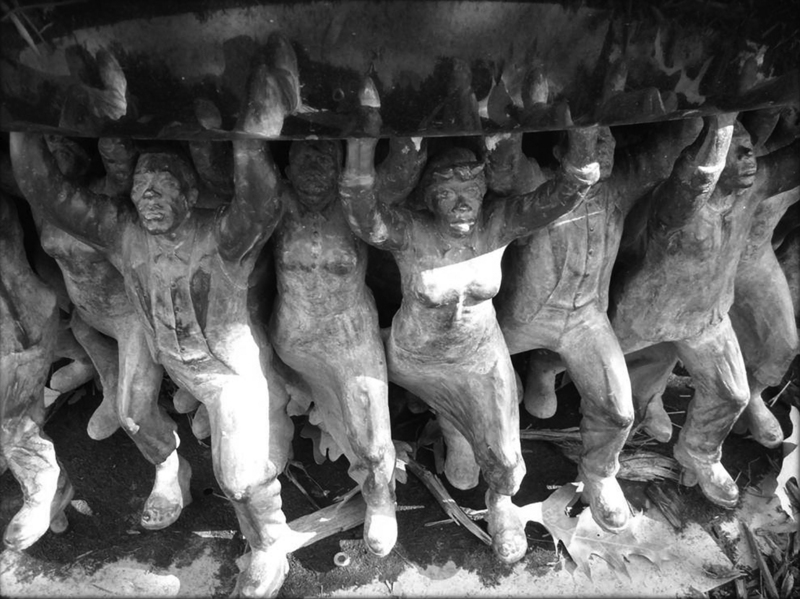 The monument is a black marble table held up by three hundred small figures designed to represent black workers who built and maintained the campus. Stone stools, modeled on the unmarked headstones (actually rocks) of enslaved people in the Chapel Hill cemetery surround the table affording visitors a place to sit. Other than a stone bench at the Davie Poplar (the mythic site of the University’s origin),12 this is the only “functional” sculpture on McCorkle Place. The Unsung Founders Memorial was officially dedicated in a ceremony that included Chancellor James Moeser (a white man), the Dean of the College of Arts and Sciences Bernadette Gray-Little (a black woman), student leaders, and some of the descendants of the “unsung” founders including Mildred Council, Fred Battle, and Rebecca Clark. The fact that descendants of the “founders” were known to the administration and were locally available to attend the ceremony indicates a dissonance between the generalized, unsung nature that was at the core of this memorialization and the specific individuals who came to represent these unsung founders. At the dedication the Chancellor said, “this memorial, I believe, attests to our commitment to shed light on the darker corners of our history. Yes, the University’s first leaders were slaveholders. It is also true that the contributions of African American servants and slaves were crucial to its success” (University Gazette, Nov. 16, 2005). Notably, Moeser uses the word “servants,” which modifies and reduces the impact of the word “slaves.” Dean Gray-Little remarked, “[O]ne of the troublesome legacies of slavery is the pall that it casts over the family histories of those who were bought and sold. This monument finally recognizes the many unnamed whose toil and talent made the nation’s first university possible” (ibid.). In a later interview, reflecting on the dedication, Gray-Little said, “People who were there to listen to the talk, who were family members of some of the very people we were talking about as unsung contributors, appreciated that I spoke of my ancestors, too” (University Gazette, Dec. 13, 2006). Despite the positive reception at the sparsely attended13 dedication ceremony, the Unsung Founders Memorial immediately had its share of vocal and public detractors who criticized it on a number of pragmatic and rhetorical fronts. The overall critique is based on incomplete and skewed remembering of the racialized past of the university and particularly the literal minimizing of the contributions of black people in a memorial aimed at celebrating and remembering them. This remembering is paradoxical in that it provides agency to those who invoke the (forgotten) black past of Chapel Hill, but in many ways denies agency to the actual black people being remembered. Specifically, the critiques of the memorial centered on 1) its non-imposing nature while being surrounded by more “monumental” monuments to the white founders of the campus, 2) its non-specificity, 3) its evasive and self-congratulatory rhetoric, and 4) its creator. In their study of race and representation in Colonial Williamsburg, Gable, Handler, and Lawson (1992) note that slaves are often presented without specificity: generalized figures who are somewhat interchangeable, while whites, lower class and upper class, are particularized and have personal agency and identity. In the Unsung Founders Memorial, the nature of blackness/Africanness, the nature of free and unfree is left unspecified and unnamed, and a more general and amorphous unsung hero exists in contrast to the fully realized and active white/European hero. The mnemonic devices used to instill historical significance in this part of the symbolic landscape of the University of North Carolina posit a general, almost universal, black person; in contrast, they posit a very specific and active white person as demonstrated by Silent Sam or the tall, white, erect obelisk which serves as grave and memorial to UNC’s first president, Joseph Caldwell, and which physically dominates the low, black, round Unsung Founders Memorial. The issue of national, racial, and historical identity is collapsed into one general ideal of blackness, while whiteness in its national, cultural, and class variability is marked as particular. There are three hundred figures surrounding the table and holding it up. One hundred are men wearing jackets, one hundred are men in shirtsleeves, and one hundred are women (all of them the same woman.) That there are only three types of black people is a message that could be gleaned (perhaps one hundred male slaves, one hundred female slaves, and one hundred free black men)—but if this is the case, it is historically inaccurate in the male/female ratio and in the slave/free ratio of ante-bellum North Carolina; and what of the free women? Particularly as the monumental landscape ages, and the original intents, actors, and debates fade, all that is left is the actual (concrete, marble, or bronze) object, or name, or in this case: namelessness. As discussed earlier, the landscape in which the Unsung Founders memorial exists is filled with specific, individual monuments, memorials, and other remembrances. The Unsung Founders Memorial—close-up of fi gures. (Photo by Timothy J. 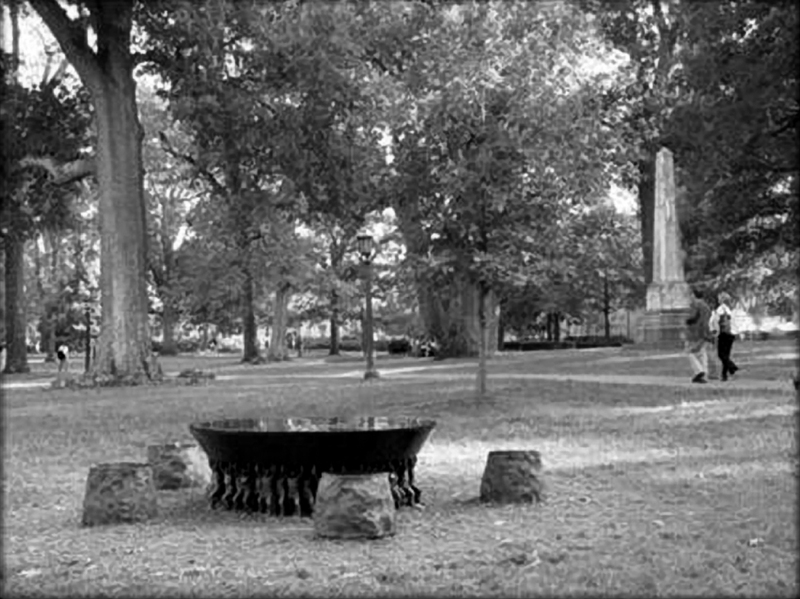 Prior to the official dedication of the Unsung Founders memorial, a University of North Carolina professor declined to participate in the ceremony and included this remark in a letter to the office of University events: “What the monument does is turn unsung founders into unseen little people, down under the lunch table and Frisbee stand. They only exist to serve” (personal communication, 2005). He goes on to say that “[t]he monument does not honor the people it is supposed to honor. It diminishes them, puts them at our feet, and into the shadow of Silent Sam. It does succeed in engaging the attention and interaction of students, but not in a way that honors anybody.” A monument that was intended to evoke a reverential and reflective response often provokes a negative reaction among those who interact with it. Or, in the case of many “users,” it is solely a place to sit with no reflection on the meaning of the memorial at all. The functionality of the monument was intended by its designer and celebrated by university officials. The idea that the monument would provide a physical meeting space to discuss issues of the racial divide, to ponder the meaning of history, was asserted. But the way the monument is used as a “mere” table, as a functional but not symbolic space, has caused a great deal of discussion and tension. A student in my Defining Blackness seminar, after studying the history of the monument and the indignities suffered by the enslaved people on campus, came into class one day and said that she was “mad” (personal communication, 2011). She had seen several white students sitting on top of the monument (a routine occurrence), and said she wanted to beat them up. This sentiment has been expressed to me numerous times, and I generally explain that most people do not know what the monument is or is intended to be, and see it as merely a table. On campus admissions tours, the monument is often described as simply “the table.” The problem is that others, often black others, view this memorial as not “just a table,” but rather as a space that is specifically connected to a past that includes black people. Creating “others” out of members of the student body is not what the artist or the promoters of the monuments stated as a goal; they proposed that the monument would create community, not divide it. In addition to the size and lack of individuality of the figures, there is also the issue of their position. 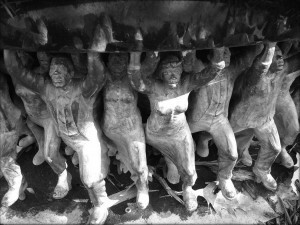 The figures support the tabletop which places them in easy reach of the feet of those sitting. Mark Auslander (2011: 29) sees these figures as akin to the “blackamoor” figures used in decorative arts, once again objectifying the black body. It is almost impossible to sit at the table without placing one’s feet on the figures which results in the wearing of the patina on the noses, knees, and breasts leaving visible markers of the ways in which these representatives of the unsung are being dishonored in practice, while being rhetorically honored on the tabletop. The worn areas are shiny and can be seen heliographing on a sunny day, drawing even more attention to the ways the only black figures on campus are invisible to those who hover above them. Many students (mostly black students) have commented on the disrespect they feel when viewing the way the figures and the monument as a whole are treated, without any discernible intent to offend by those who are merely sitting at the table as designed. The Unsung Founders Memorial—close-up of “tabletop.” (Photo by Timothy J. The rhetoric of the Unsung Founders Memorial mirrors the ambiguity and forgetting that the physical design of the monument incorporates. 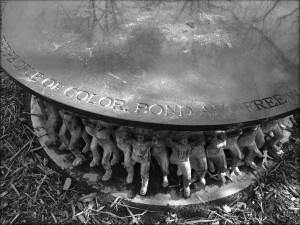 The inscription carved on the perimeter of the table top states: “The Class of 2002 honors the University’s unsung founders the people of color bond and free who helped build the Carolina that we cherish today.” While the intent of the designer and the committee which commissioned and approved the memorial was very clearly to remember the black people who have been so often forgotten in American history, specifically in the history of the University of North Carolina, the inscription equivocates and refers to “people of color,” thus including all non-white people, even though there is no documentation of non-black/non-white people being involved in the early construction of the campus. If the intent is to differentiate mixed race people from black people, it was never publicly expressed, nor is it imagined in the bodies that hold up the tabletop. If the intent is to comment on current race issues and the current demographics of UNC, the language is more understandable, but the memorial’s message becomes more muddied and its vision of honoring less grounded. The memorial, which is universally assumed (and often explicitly asserted) to pay homage to the enslaved people who built the ante-bellum campus, does not include the words slave or slavery. In discussions with a member of the team that worked to create the inscription I was told that the word slave was found to be offensive (due to its alienating and dehumanizing aspects that treat a person as property) and thus was purposefully excluded. But by choosing a weaker and less historically precise term, the strength of the monument is also weakened. The rhetorical obfuscation ignores the reality that enslaved people in Chapel Hill (as elsewhere) were property that could be rented, sold, inherited, and lost in a bankruptcy, and makes it easy to forget that the vast majority of black Chapel Hillians in the antebellum era were legally slaves under the laws of North Carolina and the United States Constitution. The most well-known free black man associated with Chapel Hill was Thomas Day, who was himself an owner of a number of slaves. Discussing his story would have problematized the rhetoric of the memorial even further and would tie this monument to a sculpture of Day that resides in front of the North Carolina Museum of History, the only black person represented there. In the official university virtual tour of the campus the memorial is described thusly: “The Unsung Founders Memorial graces the McCorkle Place lawn in front of the Alumni Building. Artist Do-Ho Suh created the memorial, which honors the men and women of color—enslaved and free—who helped build Carolina. The memorial was installed on May 11, 2005” (UNC, Unsung Memorial). The university website rewrites the language of the monument, replacing the more general “bond” with the much more specific “enslaved,” but it does not replace the more general “color” with the more specific “black.” Even the virtual landscape encodes and enhances the ambiguities of the Unsung rhetoric. The unwieldy phrase “Unsung Founders Memorial” also harkens to the vague and general notion of black people as portrayed in Colonial Williamsburg discussed by Gable and colleagues (Gable, Handler, and Lawson 1992). While there are many memorials and monuments on campus that specifically remember individuals, this is the only monument that explicitly remembers forgetting, as can be inferred from the trope of the “unsung” as well as from the repeated black bodies beneath the tabletop. At the dedication ceremony the descendants of some of the university’s enslaved workers who attended attested to being very content to finally have some recognition of their family history. But just as the figures holding the tabletop lack specificity, so too does the rhetoric that informs the memorial. and gravesite of President Joseph Caldwell. To the south, and also visible from the Unsung Founders Memorial, is the Founding Trustees Memorial which lists the names of the 55 first trustees of the University of North Carolina, and carries on it an image of William Davie, a trustee and donor. 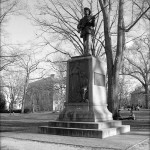 Directly to the north of the Unsung Founders is the Confederate Soldier Memorial (Silent Sam) which very specifically refers to “the 321 alumni of the University who died in the Civil War and all students who joined the Confederate Army.” The names of these 321 people can be found on plaques in Memorial Hall, a five-minute walk from the statue. Why are these specific names omitted from the Unsung Founders Memorial when the names of the Confederate dead are carved into the walls of Memorial Hall and the trustees on their monument? Why is the word slave missing from the Unsung Founders Memorial while the names Jefferson Davis and Daniel Boone can be found on neighboring Franklin Street specifying a highway and a trail? Perhaps the Unsung Founders Memorial actually celebrates modern people singing the songs of the unsung and moves the agency from those who built the campus to those who built the monument. And this may indicate something about the recent trend to remember, interrogate, apologize for, and pay respect to those people of color, “bond and free,” who worked at universities across the United States. A final rhetorical point is the use of the word “we” in the inscription. This “we” is suspiciously similar to the first word of the United States Constitution which clearly did not include many people, enslaved and free, at the time it was written. The “we” on the Unsung Founders Memorial indicates that the “we” who honors those who built the campus may not be the people who did build the campus. This othering is a problem that has dogged the monument in that it is sometimes interpreted as a manifestation of white guilt (or subsumed under political correctness), and not a statement of a new, more inclusive body politic which includes the descendants of the enslaved together with the descendants of the slaveocracy. This interpretation is particularly important when examining the legacy of labor relations on campus where the racial make-up of faculty, students, and staff population does not match that of the state, with “people of color” overrepresented among the lowest paid workers and whites overrepresented among the faculty and students. When considering the “we” in the inscription, the racial identity of the subject and the observer comes into question. As all memorials do, the “Unsung Founders” purports to remember the past but actually interrogates its present, in this case 2005. Today, however, the Unsung Founders Memorial is literally lost in the landscape of the campus but also in the memoryscape of the university. The choice of Do-Ho Suh as the artist to design this memorial inspired its own set of controversies, due more to his race and ethnicity than his artistic ability. In a number of informal conversations, blog postings, and interviews, questions were raised about the lack of an African American artist, or at least an American artist. Others have seen this as insignificant in terms of public art or as possibly significant in terms of inclusion and/or color blindness. And, of course, for those who only view or sit on the monument, the backstory is non-existent. Still, local myths have arisen that there were no black artists considered for the commission, and that no black people were involved in the selection of the artist. University officials took great pains to refute these suggestions when they appeared in the press. The vice-president of the class of 2002 is a black man and one of the four members of the selection committee; he also attended the dedication ceremony along with Provost Bernadette Gray Little, the highest ranking black official in the University at the time (the fact of her rank was duly noted in press releases about the event). An article in the campus newspaper, the Daily Tar Heel (May 23, 2002) announced the selection of Do-Ho Suh as the artist to design the memorial: “The gift of the class of 2002, the memorial will be designed and produced by Korean artist Do-Ho Suh. Fourteen artists submitted portfolios of their work to the senior gift committee. Four finalists were invited to the campus, and Suh was eventually chosen.” Quoted in the Daily Tar Heel, senior class president Ben Singer said, “Do-Ho is a very soft-spoken man—he’s very observant. He grew up in similar oppressive circumstances in Korea, where he’s from.” This connection to the rhetoric of “people of color” and oppression is another manifestation of symbolically tying the memorial more tightly to the twenty-first century than the nineteenth. An interview with Designboom (Designboom 2007) contradicts the notion that Suh grew up in oppressive circumstances (and the implication that the oppressive circumstances were slave-like is problematic in and of itself). In the interview Suh states, when asked about his childhood, “a unique part of my father and my growing up was actually his practice, although he was a professional painter, he was pretty much the last sort of scholarly painter in Korea. … my grandfather was also a scholar … my mother also loves art, she’s a housewife, but is also very involved in preserving Korean heritage and culture.” The interview also discusses his significant installations; the Unsung Founders Memorial is absent, as it is from most public discussions about Suh’s art. It has vanished from Suh’s personal and artistic history; this monument is forgotten, it seems, even by its creator. 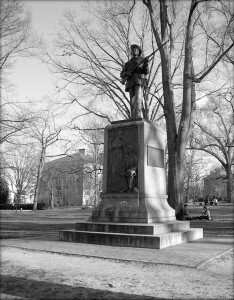 Four years after the dedication of the Unsung Founders Memorial, the monument (along with its neighbor Silent Sam) served as a metaphor for current racial oppression in Chapel Hill (the city as well as the university). Poet C. J. Suitt argued that the statue offended him in part “because only one black person was on the selection committee. No black artists were considered, and the artist who was chosen specialized in miniatures” (News and Observer, Nov. 29, 2009). In response to this published article university officials contacted the News and Observer and stated, “Two of the four students on the selection committee were black. One of the three artists who came to Chapel Hill for interviews was black.” Later on, it was clarified that “the students sent requests to 70 artists and 11 wrote back. The students chose four finalists and three eventually came to Chapel Hill for interviews: a black person, a Latino person, and Do-Ho Suh, the Korean artist eventually selected” (News and Observer, Nov. 29, 2009). The discussion of the race of the artist and his ability to portray a black experience is reminiscent of the recent discussions regarding the Martin Luther King Jr. Memorial that has been erected on Washington D.C.’s Mall. The ethnicity and nationality of the artist, Lei Yixin, from the People’s Republic of China, have been called into question in judgments about the meaning of the memorial. Arguments were presented in a variety of forums that King should be memorialized by a black artist using black workers.14 The discussions that emphasize Yixin’s race and ethnicity (and those of the candidates who were not selected) indicate the many layers that the memorial process occupies. As with Maya Lin and Do-Ho Suh, they once again interrogate the “we” that is creating and consuming the memorials. What is the function of a monument that does not celebrate the past but problematizes it and examines victimhood? Why would institutions emphasize negative or at least conflicted aspects of their past? Monuments to those harmed by slavery, racism, and other denials of human and civil rights can be read as symbolic reparations and as correctives to institutional memories. In this monument, at least, the harm is not specified, just the honor that now ensues for persisting long enough to be resurrected. In addition to the Unsung Founders Memorial, UNC has also very recently erected a memorial in 2011 to those who fought against North Carolina’s Speaker Ban Law, and named a dormitory after famed slave poet and sometime Chapel Hill inhabitant George Moses Horton15 in 2006. Horton Hall is the first building on a primarily white university campus to be named after a person who was enslaved. Recent self-examinations of the role of slaves and slavery at Brown University, William and Mary, Yale, Emory, Clemson, and the Universities of Texas, Virginia, South Carolina, Alabama and many others have led to questions about the place of memory and forgetting, and the need for public symbols of remembrance. Many of the discussions have centered on how slave-owning faculty and students16 are memorialized in building names, scholarships, and awards, while the names of the enslaved who served the students remain obscure. The “Slavery and the University” conference held at Emory University in February 2011 illustrates the great variety of ways in which twenty-first-century universities are exploring their histories with slavery and the ways they are choosing to publicly remember this history. Of course, this is part of a broader societal discussion of slavery and racism in institutions such as the federal government and various state governments,17 as well as in private institutions including banks and insurance companies. A 2010 report from the North Carolina Capitol Memorial Study Committee illustrates some of the rationales for transforming memorial landscapes, in this case the grounds of the state capitol in Raleigh. The committee recommended two options to enhance the memorial landscape on the state capitol, the first a memorial to black NC troops in the Civil War. Significantly, in discussing a design for the memorial the committee recommended, “a monument, depicting an African American soldier who fought on behalf of the union … would take the form of a life-size bronze statue atop a granite base. In that respect, it would be keeping with other memorials already in place on Union Square and would be a counterbalance to the 1895 Confederate monument” (2010: 15). Clearly, this is a very different philosophy than that used in attempting to counterbalance Silent Sam with the Unsung Founders Memorial, where a monument dedicated to the concept of heroism is contrasted with one to victimhood. The second option proposed by the committee was a memorial to U.S. representative George Henry White and to Ella Baker: “In the committee’s discussions it was observed that both options … would commemorate expressions of defiance” (2010: 16). The discussion of memorializing defiance instead of service, agency versus objectification, is a critical difference between the capitol’s memorialization approach and that on UNC’s campus. As more of the decisions about memorialization are made by those whose race, gender, sexual orientation, and/or class left them disempowered in the past, it seems likely that the nature of memorialization will change in the direction seen in the capitol memorial discussions. The acknowledgment of the new “we” that memorializes is a critical component of this discussion that marks it as a clear departure from the process that created the Unsung Founders Memorial. It is not the denial or transcendence of oppression that is portrayed by the Unsung Founders Memorial but rather persistence through oppression. The memorial recreates an order in which anonymous little people (metaphoric and literal) stand ready to serve others in mute silence. This disconnect is not artistic but symbolic. The various objections raised—the size of the monument, the visibility in the landscape, the perceived lack of empathy and understanding of the artist, the refusal to name names, the ability to easily misuse the memorial by standing or sitting or changing a baby’s diaper on it—are all indicative of the core problem. Who and what is actually being remembered and who is doing the remembering? This demonstrates the view that the Unsung Founders Memorial is intended to be part of the collective process of creating a more inclusive community by using symbols of the past and problematizing a landscape that tends to emphasize the white, male, and powerful. Mark Auslander in his recent study on remembering slavery at Emory University through the story of Miss Kitty18 has proposed that the twenty-first century has ushered in an era of “public processes of documented trauma, truth telling, apology, and reconciliation” (2011: 28). He argues that the reparations movements and such new pedagogies as community-engaged research and service learning have opened universities to self-analysis with regard to their slave-owning and slave-trading pasts. He concludes, that “[i]n complicated ways, it has become more acceptable, albeit in fits and starts, to reenvision enslaved persons, so long excluded from the academy’s self-conception, as members of the university family” (2011: 28). David Pitcaithley (2006) discusses similar transformations of policy and pedagogy in the National Park Service in the late twentieth and early twenty-first centuries. He attributes the changes to a growing concern by Congress and historians to create a more inclusive, and a more “explanatory” history to replace a reverential and particular set of stories. Of course, these changes to policy and interpretation were met with a strong backlash from those most invested in the worldview that was supported by the earlier presentation of facts. Pandering, political correctness, and historical revisionism were terms repeated often in the responses to the changes by the Park Service. The same responses can be found in many of the letters to Chancellor Moeser regarding the “Remembering Reconstruction” conference. I would argue that the new symbolic inclusion in the university family is due in good part to the changing demographics of higher education, both in terms of faculty but more importantly in terms of students, as well as broader demographic changes in the United States as a whole. Including those who might symbolically identify with the subordinated and subaltern in the larger body politic makes perfect sense in a United States where (non-Hispanic) European Americans are declining as a percentage of the total population. Dovidio and colleagues (2001) examine the ways in which racial and ethnic identity affect the ways that students identify with each other and with the institution. Creating symbolic mediators to try to draw people across racial boundaries into a shared identity with a shared history makes simple pragmatic sense. In the case of Chapel Hill, from 2000 to 2010 in the United States census, whites dropped from 77.9 percent of the population to 72.8 percent; Latinos increased from 3.2 percent to 6.4 percent; Asians from 7.2 percent to 11.8 percent; and perhaps most significantly, blacks dropped from 11.4 percent to 9.5 percent, making them no longer the majority minority in the town. Clearly, tying the interests of the demographically declining groups together through a proposed “we-ness” (albeit a shared history of one group oppressing the other) could be a useful political act and may be informing the increasing number of slavery and university discussions across the country. In 2012, I continued to teach “Defining Blackness,” and the “Black and Blue” tour has now become part of the institution, with multiple tour guides taking students and community members through the campus to discuss black histories. The Unsung Founders Memorial is the starting place for most tours, and continues to provoke many conversations about how the past remains in the present and how the past is recreated. The goal of fostering discussion about campus history and racial divides has been accomplished, if not necessarily in the way the artist or the administration originally intended.
. Many primarily white institutions (PWIs) in the lower South, such as the University of Mississippi, have explicit symbols of racial segregation and slavery embedded in their cultural fabric—the retirement of Colonel Reb as mascot in 2003, and subsequent attempts (as recently as 2012) to bring him back illustrate an explicit divide rather than the more implicit one at UNC. The recent debate about renaming Simkins Residence Hall at UT Austin (Simkins was a Ku Klux Klan organizer in Florida) also illustrates this point.
. In her discussions about John Brown and his namesake university, Melish demonstrates how contested histories can become reified and unambiguous to their supporters. On the discussion about John Brown that emerged at the John Brown House, she mentions the conflict between two academics over the legacy of Brown: “[L]obban saw Lemmons as an apologist for slavery; Lemmons saw Lobban as an ahistorical and factually inaccurate zealot” (Melish 2006: 108.) Memorialization often takes one historical perspective and then crystallizes it, even today.
. Cornelia Phillips Spencer was the daughter of UNC Professor James Spencer and sister of UNC graduates Samuel and Charles Spencer. She is one of the most well-known writers about antebellum and reconstruction Chapel Hill and an advocate for women’s education. William Battle was a local judge and law professor, and the father of Kemp Battle, president of the University during and after Reconstruction.
. Joan Sherman in the Black Bard of North Carolina (1997) provides an excellent overview of the life and poetry of Horton, working from archival sources in the University collection including Cornelia Phillip Spencer’s and David Swain’s papers.
. Photographs of both the York and the Sacajawea statues are available on Lewis & Clark’s website under the “Visiting Campus” tab.
. The University Archives, the Southern Historical Collection, and the North Carolina Collection photo archives, all housed in the Wilson Library on the UNC campus (and all open to the public), possess a wealth of primary sources about the enslaved and free black population of the university and the town of Chapel Hill.
. UNC GAA, Jan. 28, 2005.
. Moeser Records Box 49 Folder Bell Award February 2005–2006.
. One of the most visited and photographed memorial spaces is actually the first building of the campus (known as “Old East”) which was completed in 1795 and has moved from being only a functional building (it still serves as a residence hall) to a memorial to the longevity of the campus. Criticisms of the student body are well documented in Chancellor Hardin’s papers in the University archives as well as in the archives of the student press at UNC. The criticisms focused on five of the seven figures in the statue: the male black figure balancing a basketball on one finger, the female black figure balancing a book on top of her head, a white couple (male and female) where the woman is holding out an apple and resting her head on the man’s shoulder while he reads her a book, and a female figure, often viewed as Asian, carrying a violin case. The real Silent Sam Movement is a UNC student- and Chapel Hill community group that formed to explore the relationship between the town/gown racial history and current inequalities in the community. Silent Sam, the Confederate Soldier Memorial, has become a central symbol of this contested history. The Davie Poplar is popularly believed to be located at the site where William Davie chose to locate the University in 1792. Davie’s role as “father of the University” is well documented and discussed in local lore; his occupation as a planter and slave-holder less so. Fewer than fifty people attended the ceremony. The debates over the King memorial are reminiscent of the heated public discussions when Steven Spielberg decided to direct the film version of The Color Purple. Horton hired his time from his owner and came to Chapel Hill to earn money in hope of buying his freedom. Unlike many of the other enslaved people who served students, Horton wrote poetry for pay instead of performing manual tasks such as hauling water, blacking shoes, and running errands. John C. Calhoun is a prime example at Yale. A residential college named after Calhoun has created controversy and discussion much as Silent Sam has at the UNC campus. In 2007, North Carolina (through bills passed by both chambers of the legislature) issued an apology for slavery and its legacies. Miss Kitty was the enslaved property of Methodist Bishop James Osgood Andrew. Andrew’s slave ownership precipitated the split between the northern and southern Methodists in the mid nineteenth century. Mark Auslander (2011) details the various ways that the story of Miss Kitty is told in white and black communities and the conflicts these mythic histories create in modern Oxford, Georgia. Auslander’s work became central to the Transforming Communities Program at Emory University which sponsored the Slavery and Universities conference in 2011. Auslander, M. 2011. The Accidental Slaveowner: Revisiting a Myth of Race and Finding an American Family. Athens and London: University of Georgia Press. Designboom. 2007. Do-Ho Suh. Retrieved March 31, 2012, http://www.designboom.com/eng/interview/dohosuh.html. Dovidio, J. S. 2001. “Racial, Ethnic, and Cultural Differences in Responding to Distinctiveness and Discrimination on Campus: Stigma and Common Group Identity.” Journal of Social Issues 57. 1: 167–88. Gable, E., R. Handler, and A. Lawson. 1992. “On the Uses of Relativism: Fact, Conjecture, and Black and White Histories at Colonial Willamsburg.” American Ethnologist 19.4: 791–805. Jones, D. 2012. “Lessons of Silent Sam: We Cannot Change History.” Carolina Alumni Review 18. Lewis & Clark College. n.d. http://www.lclark.edu/visit/features/york/ (accessed March 25, 2012). exhibits/slavery/ (accessed March 20, 2012). Melsih, J. 2006. “Recovering (from) Slavery: Four Struggles to Tell the Truth.” In Slavery and Public History: The Tough Stuff of American Memory, edited by J.O. Horton and L.E. Horton, 103–33. Chapel Hill: Univerity of North Carolina Press. Pitcaithley, D. 2006. “A Cosmic Treat”: The National Park Service Addresses the Causes of the American Civil War. In Slavery and Public History, 169–86. Report, N. C. 2010. North Carolina State Capitol Memorial Study Committee Report. Retrieved March 25, 2012, www.ncdcr.gov/capitolmemorial.pdf. Savage, K. 2009. Monument Wars: Washington, D.C., the National Mall, and the Transformation of the Memorial Landscape. Berkeley: University of California Press. Sherman, J. E. 1997. The Black Bard of North Carolina: George Moses Horton and His Poetry. Chapel Hill: The University of North Carolina Press. .unc.edu/ (accessed March 10, 2012). ———. n.d. Unsung Memorial. http://www.unc.edu/tour/LEVEL_2/unsung.htm (accessed March 10, 2012).